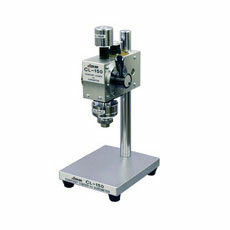 Steady, stable, andreproducible hardness measurement allowed by the flexible jointsystem. The problem with manually measuring the hardness of a rubberspecimen is that the results may vary with the operator. The CL-150series eliminates such variations. 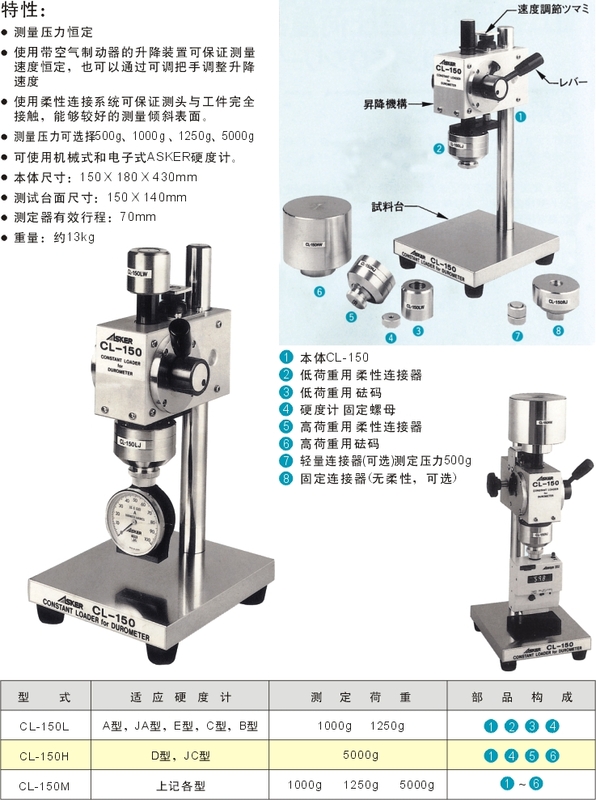 The flexible joint system makesthe pressure foot of the durometer contact perfectly with the testpiece and thus enables a precise and reproducible measurement.Furthermore, the models may be used for durometers requiringvarious measuring loads by replacing the weight. The durometer's pressure force to thetest piece is kept constant with the static load comprised of theweight, joint, and mechanical part. 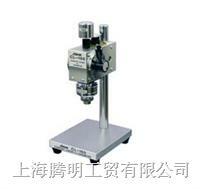 Pressure speed to the test piece is alsokept constant with using the up-down lift with air damper. Thespeed may be changed using the adjusting knob. Unlike models with ahydraulic damper, this loader is free from oil spills and requiresno oil feeding. The flexible joint system enables firmcontact of the pressure foot with the surface of the test piece,even if the surface is inclined. A dual-purpose model featuring thefunctions of both CL-150H for heavy load and CL-150L for lightloads. Conversely, CL-150L and CL-150H may be used in a similar wayto this model by adding optional parts. Attachable toanalog and digital Asker durometers.